Fire up the blender to make these easy Not-Too-Sweet Banana Apple Muffins in about half an hour! Darrol Henry is four now (ohmygoshwhat), and he loves when he can do things on his own. Lately, that’s manifested in a muffin-making kick around here. 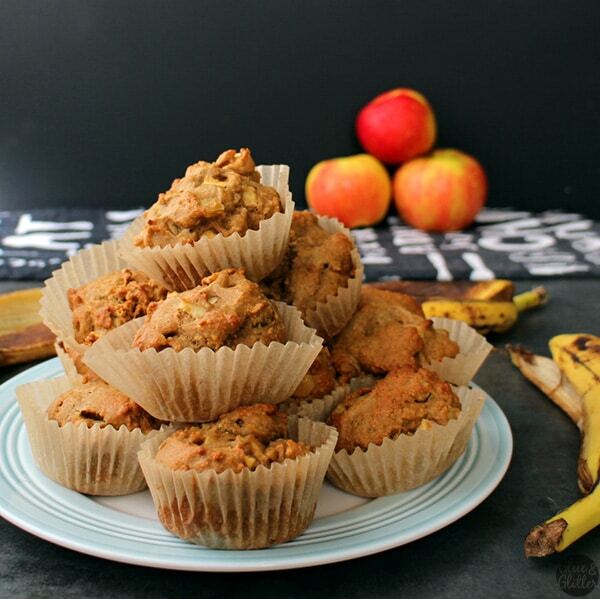 He helps scoop and stir ingredients, and the Not-Too-Sweet Banana Apple Muffins are an easy, healthy breakfast that he can grab himself. The counter whole kitchen is going to be a mess. I’m a pretty tidy baker when it’s just me, but adding a four-year-old to the equation ups the mess factor exponentially. Throwing a kitchen towel underneath the bowl helps contain the mess somewhat, but definitely don’t make muffins with your kid if you just vacuumed. You’ll just be vacuuming again when you’re done. And mopping. And maybe scrubbing. Kids can do more than you think. I was nervous about letting Darrol do some of the more precise baking tasks, like measuring, but he has surprised me with his ability. After showing him how to scoop and even out a measuring spoon or how to measure out sugar, he has picked it up and done a great job. Not that I can hand him dry ingredients and walk away, but with light guidance, he can do it really well on his own. But they can’t do everything. You know your kid’s limits. I don’t let Darrol do anything close to the oven, because he is just little bit too wild to be trusted, for example. You can push your kid’s limits some, but if your parenting alarm is going off about a specific task, I think it’s a good idea to listen. Kids don’t know basic hygiene. The first time we baked together, Darrol had to wash his hands about 1700 times, because every time I looked at him, he had his hands in his mouth or was touching the floor somehow. Now, before we bake, we go over basic hygiene rules. “Once you wash your hands, don’t touch your face, don’t touch the floor.” Your reminders may vary, depending on what gross thing your kids do after they’ve washed their hands. The options are limitless, I’m pretty sure. One thing I’ve noticed during our muffin-making adventures is that most muffin recipes are basically just unfrosted cupcakes. I’m not opposed to a sweet treat from time-to-time, but starting the day with a cupcake just leads to hanger meltdowns later (for me and for Darrol). 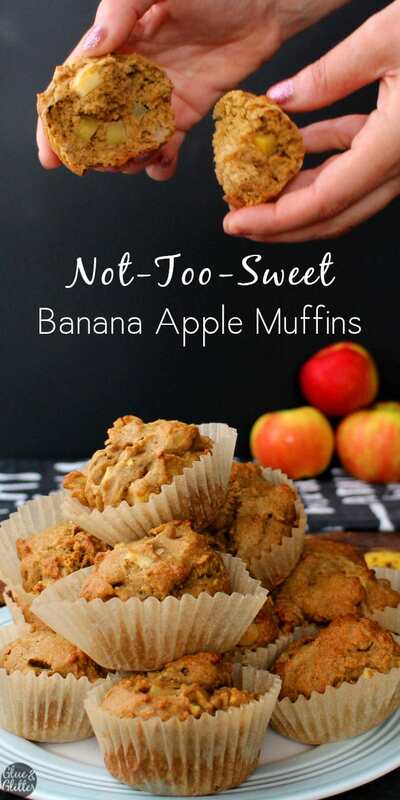 These Not-Too-Sweet Banana Apple Muffins contain much less added sugar than a typical muffin recipe. Instead, they get most of their sweetness from the bananas and the apple pieces. OK! Are you ready to make some muffins? Let’s do it! adapted from Taste of Home.We've been making these recipes about once a week and experimenting with mix-ins! Instead of the chopped apple, we've really liked these with 1 - 1 1/2 cups of blueberries, 1 1/2 cups frozen cherries (not thawed), or 1 cup sliced strawberries. Darrol, my son, loves that he gets to choose each week's muffin addition! In a large bowl, mix together the flour, brown sugar, baking soda, and salt. Combine the bananas, aquafaba, and olive oil in your blender. Pour the blender mixture into the flour mixture, then stir in the apple pieces. Use a spoon or an ice cream scoop to scoop the batter into a lined muffin tin. You want each cup about 2/3 full. Bake for 18-20 minutes. Cool for 10-15 minutes before serving. Most of the sweetness in this recipe comes from the bananas, but there is a little bit of brown sugar to up the sweetness. I have cut the refined sugar down as much as possible already. The recipe that I adapted this from used 1 cup of sugar. If you absolutely do not do refined sugars, I recommend adding 3-4 pitted dates and blending them with the wet ingredients. Tried this recipe? 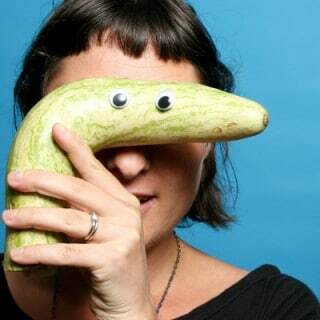 Share your photo!Mention @GlueAndGlitter or tag #ggveg on Instagram! This looks good as well as easy and quick. I am not vegan just trying to cut back on carbs. Can I use an egg with the same results? These look so delicious. 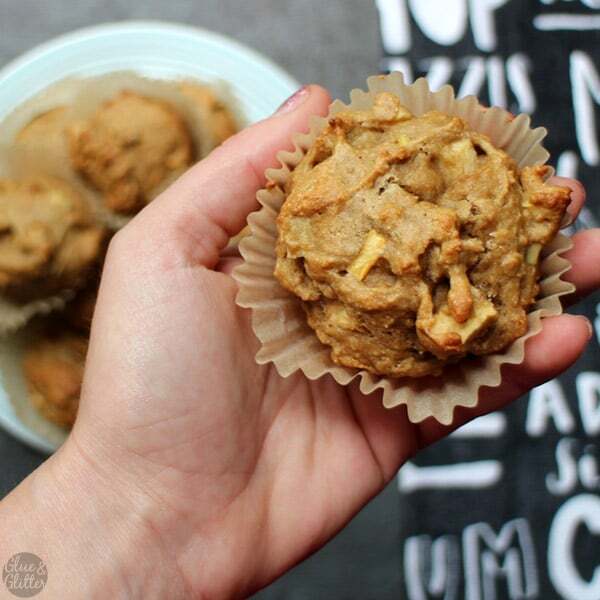 I’m always on the lookout for lower sugar muffins – excited to try them! Love the video and tips for baking with the kiddos! I’m with Jenn – I don’t like my muffins too sweet, so these look perfect! These sound great. I definitely don’t like my muffins too sweet, so these sound perfect to me!